This body lotion is perfect for the normal till dry skin. But let’s start with telling you about the smell… Mmm, it smells so good, you can smell the lavender on a natural way! It’s just like you are standing in a lavender field in France, so good does it smell! But also the body lotion itself is so good! The lotion feels silky soft and it almost directly soaks into the skin. It makes your skin extremely soft and hydrates it. It also gives your skin a subtle lavender smell. This body lotion is so good for this summer to smell heavenly to lavender! I use this oil mainly for my legs. Because these are in the summer a bit dryer of all the waxing and such an oil is also perfect for my anti cellulitis massage. 😉 This oil smells also way to good and after massaging it in you smell the lavender still very subtle. And just like the lotion feels this also fantastic! If you have a dryer skin or for a massage is the oil just perfect! It feels amazing to use or massages yourself with it! And after it you will have for sure a baby soft skin! This oil is also very easy to dose thanks to the amazing pump system that it has! This deo smell so hard to lavender, but it smells good! But that smell is after a few hours gone, but it didn’t made place for a sweat smell! So even with this sunny summer I don’t sweat so this deo keeps my armpits dry! Of course this deo don’t survives a sport session in this heat… But for a normal hot day gives this deo enough protection. It’s a good deo that does what it must do! 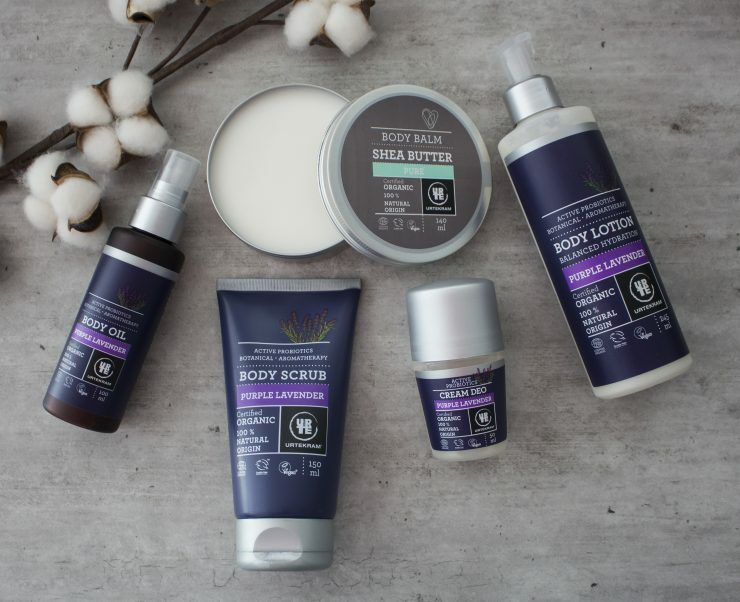 I’m a big fan from shea butter, especially when it is in his purest form! This is a product that you can use on so many ways! I find it a must have because it’s perfect for every dry spot! So think about dry hair, nails, skin, lips,… Shea butter is just perfect for everything! It hydrates the skin intense without letting a greasy layer behind. Also is such a cane economical in use, you just need a bit! My first experience with urtekram is extremely positive so I’m sure that this isn’t the last time! It’s a good and natural brand! And these products are vegan so not tested on animals! This is so important to know! And expect that are these products just heavenly good, for sure the smell! This is not a chemical smell, but just the real lavender smell! So bonus points to urtekram! If you love lavender or if you are looking after products with a relaxing smell are these just the best! In Belgium is urtekram available at the carrefour, but you can also buy it online. Heerlijke producten zo te lezen en een natuurlijke lavendelgeur, daar hou ik ook van! Ja, de geur is goddelijk! Ik vind het zo handig dat de bodylotion met een pompje is. Dat wil ik het liefst bij al dit soort producten. Ja klopt, dat is echt geweldig en ook zeer hygiënisch! Klopt, de prijzen vallen goed mee voor zo’n top producten! Bij de Carrefour? Toevallig gaan we volgende week naar België dus ik zal eens kijken! Kende dit merk nog helemaal niet, maar het lijken me erg fijne producten om te gebruiken. Ja, deze zijn echt mega fijn! Ja, die geur is echt heerlijk he! Oeh, wauw. Klinkt wel heel goed. En met lavendel kan je in mijn ogen nooit fout doen. Zo’n heerlijke geur! Ook makkelijk dat je al deze producten bij Carrefour kunt verkrijgen. Had ik geen idee van!